Genuine decadence in a bar, that’s exactly what Majani’s Milk Chocolate & Hazelnut Bar is. Creamy smooth texture with a sweetly fragrant aroma and an added nutty flavor, this milk chocolate hazelnut bar can be the perfect solution to your chocolate cravings. It can also be a wonderful gift to a fellow chocoholic for anniversaries, birthdays, or just any special occasion. Even during simple days, when you simple want something sweet, this creamy Gianduia bar will definitely hit that spot. 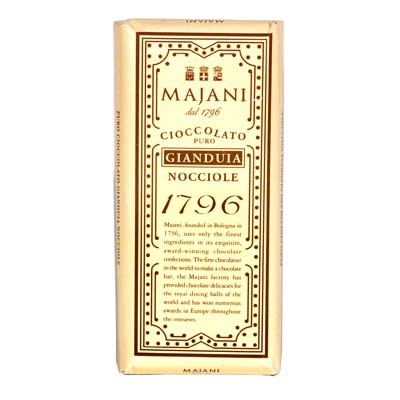 With their chocolate factory in Bologna, Majani has been making world class Italian chocolate since 1796. I gave it to my boss as a gift and she loved it!